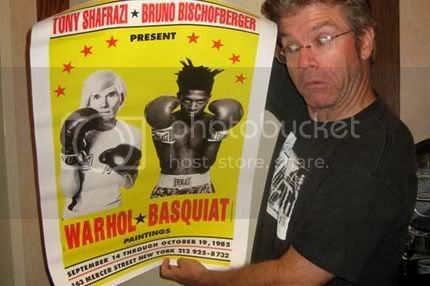 A few years ago, I bought this cool Warhol-Basquiat poster on eBay. I never hung it up, just put it all rolled up on a shelf. It is 9 years later, now I am going thru all my junk and it has a little wrinkle but is otherwise good as brand new. It is a 1999 Tony Shafrazi reprint of the 1985 original, printed on great, thick paper. I bought it on eBay for $150 and I could sell it for that if I wanted to, but I want YOU to have it for free. I also want you to see the new issue of Coagula Art Journal. After 17 years of being a freely distributed magazine, we have gone print-on-demand. You can download the issue as a pdf file at our http://COAGULA.net website. If you like it, you can buy the color glossy Coagula Art Journal book online as well. If you want to enter a contest to win my Warhol-Basquiat poster, just download the new issue of Coagula at http://COAGULA.net for free. Your entry has to be in by late July so get the details now. There is NO purchase necessary to win this poster, but I am thinking you might want to buy the print-on-demand issue of Coagula after you check out your free pdf download of issue #98. There is a lot to enjoy in it: our interview of the artist collective Finishing School, art career advice from Alan Bamberger, the continuing saga of life as an artist from Gordy Grundy as well as photos and coverage of the Los Angeles art scene. This contest is void where prohibited. It is quite simple to enter. Just download our free pdf of issue #98 and look for the contest rules as you catch up on the LowDown on High Art! Coagula Art Journal Issue #98 now available as a free PDF file download. I hope you enter sweetie, I'd love to see it hanging in our house!